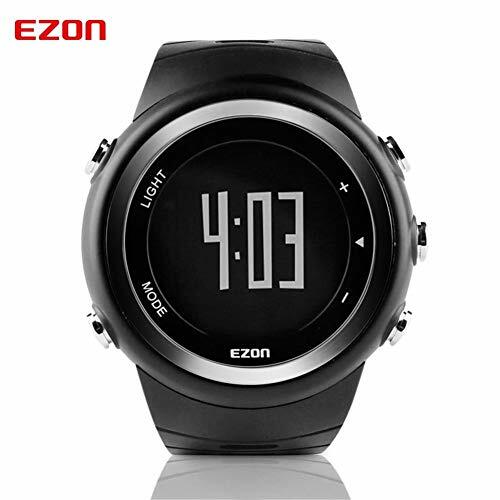 Thank you for purchasing EZON running sport watch. This is a multi-functional watch which has time, calendar, alarm, stopwatch, and also can measure steps, distance, speed and calories. You can view the exercise records of the last 10 days. Digital Watch with Multi-Functional: complete calendar, water resistance, stop watch, back light, chronograph, alarm, repeater. Pedometer: With a build-in pedometer, this watch can count each step you take by detecting the periodic motion of your arms. It displays your step number and your exercise distance in real time so that it is giving a more accurate result than most ordinary smart phones. To wear this watch at work time or any time, it will inform you exercise status. Perfect for All Sports: shockproof with large face and super easy to read LED screen, ideal for running, swimming, hiking, fishing and other outdoor and indoor sports. If you have any questions about this product by foreverwen, contact us by completing and submitting the form below. If you are looking for a specif part number, please include it with your message.